As noted in our Twitter update, it does appear that Time Warner Cable’s Northeast Ohio division has rolled out the first wave of its coming HD channel lineup expansion. We aren’t near the OMW World Headquarters and our own TWC installation, or we’d verify it for ourselves. “Time Warner Cable is an industry leader and committed to delivering more high definition offerings for our customers to enjoy,” said Steve Fry, Time Warner Cable Northeast Ohio Division President. Palladia HD, channel 469, is a music-centric high definition television channel featuring music programming from MTV, VH1 and CMT. Palladia features concert series, events, and original Palladia productions including: VH1 Storytellers, CMT Crossroads, MTV2’s $2 Bill, MTV Video Music Awards, VH1 Hip Hop Honors and CMT Music Awards. Original programming includes a weekly music video countdown show, artist interviews, backstage extras and a concert series. Discovery Channel HD, channel 449, is dedicated to creating the highest quality non-fiction content that informs and entertains its consumers about the world in all its wonder, diversity and amazement. The network offers a signature mix of compelling, high-end production values and vivid cinematography across genres, including science and technology, exploration, adventure, history and in-depth, behind-the-scenes glimpses at the people, places and organizations that shape and share our world. USA HD, channel 443, is a leading provider of original series and feature movies, sports and entertainment events, off-net television shows and blockbuster theatrical films. SCI FI HD, channel 476, is a television network where “what if” is what’s on. SCI FI fuels the imagination of viewers with original series and events, blockbuster movies and classic science fiction and fantasy programming. Disney HD, channel 456, is a 24-hour kid-driven, family inclusive television network that taps into the world of kids and families through original series and movies. More channel additions will be announced as they become available each month. By the end of July, Time Warner Cable customers will have over 30 new HD channels and more than 60 total. Additional HD channels will continue to be added through the end of the year. It’s pretty quiet on the radio/TV front in our home base area of Northeast Ohio, but there are plenty of items from Central Ohio. And…maybe one or two with a Cleveland-area link. ANOTHER ANALOG BITES THE DUST: With new FCC rules allowing public TV outlets to turn off analog transmitters with little fuss, another Ohio station has done so. According to the station’s website, THE Ohio State University’s WOSU/34 Columbus, and sister WPBO/42 Portsmouth, powered down analog transmitters at 7 AM this morning, March 31. A new ruling announced by the FCC has given public television stations an opportunity to shutdown their analog signals between March 27 and March 31. Given this ruling, WOSU has shut down its analog transmitters for WOSU Columbus and WPBO Portsmouth on March 31st at 7am. WOSU analog will have been on the air for slightly over 53 years. There are a number of factors that have led to this decision. Certainly, one is that in shutting down at the end of the month in lieu of June 12th, WOSU will save about $26,000 in utility bills at a time when that savings is critical to our budget. However, that’s not the only consideration. Through Nielson numbers, we have seen a dramatic drop in the number of “unready” households in the Columbus market (those over-the-air viewers with analog sets without a converter box). With the Fox affiliate going off analog in February, many have gotten the message. Also, by going off now, we are able to begin the process of taking the analog equipment off the tower, allowing us to maximize our digital over-the-air signal, which is now at half power. As more folks are tuning in through digital converter boxes or digital televisions, its critical for us to be at full power. This is as good a time as any to remind readers that we’re about to launch a sister blog that’ll handle the “heavy lifting” of reporting about the digital TV transition. ON THE COMMERCIAL SIDE: TV/newspaper group Media General has brought out the job cut axe again, and we’re not even sure that we’re shocked by the numbers anymore. The company has eliminated 130 positions. A reported 25-plus were cut at WNCN Raleigh, a dozen more at WJAR Providence, and 53 were laid off at Media General’s TV-newspaper collective in Tampa, known as the Florida Communications Group, which also eliminated another 12 positions. The layoffs are across all departments and “nearly all” stations, says a spokesperson. Media General owns Columbus NBC affiliate WCMH/4, and we haven’t yet uncovered news of layoffs at “NBC4”. But we uncovered this unrelated story on the station’s website, with a headline that looked odd to us considering the information we were seeking: “Your Money: NBC 4 Helps You Connect To Jobs”. Central Ohio responded to keep (WCVO) 104.9 the River fully funded for the next six months during the radio station’s Spring 2009 Fundraiser. Over 2,400 donations were made during the week of March 23rd causing the on-air fundraiser to end six and a half hours early. AND CLEVELAND: And beyond, due to the signal reach of Clear Channel talk blowtorch WTAM/1100 in Cleveland. We mentioned Monday that some of WTAM’s distant listeners in some of those “38 states and half of Canada” are having a tougher time picking up the Cleveland talker, because Fargo ND market talker WZFG/1100 Dilworth MN “The Flag” has been operating at full daytime power at night due to the flooding emergency situation in North Dakota. Yes, the FCC does allow that operation in such situations – though as we recall, stations taking advantage of the provision do have to go non-commercial during those extended hours. 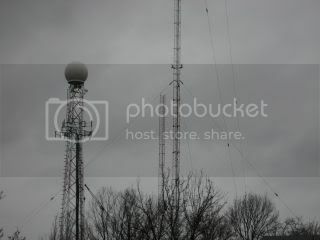 WZFG is operating at 25KW ND ch/nightime as of 3/27/09. 3/28/09 was at 50kw ND. Operating under FCC Rules Part 73 section 1250. Will continue at 25kw as long as broadcasting under emergency conditions. Probably 5 to 7 days. May go back to 50kw if there are any new major flood related emergencies. As we mentioned Monday, WZFG’s night power level is usually 440 watts. The award, named after one time Channel 8 sports director, John FitzGerald ,was presented by Channel 3’s Tom Beres, the Channel 3 AFTRA shop steward and an AFTRA Local board member. FitzGerald himself participated in the presentation and reported on the union’s health and retirement fund. FitzGerald has been a trustee of the fund for years. Joe has been active in local AFTRA for more than 30 years serving as the current President and former vice president. We’re a bit on the late side for your usual Monday morning update, as we’ve been spending time struggling with local Internet issues. PD ON THE DEFENSE: In the today’s troubled world of newspapers, those publications are turning to a tried, tested defense…”The rumors of our demise are greatly exaggerated”. That’s pretty much it in a nutshell for the Cleveland Plain Dealer, which is putting out all the stops after that now-infamous online list of “10 Troubled Newspapers”, mistakenly attributed to Time Magazine due to its presence on that magazine’s website. The paper has taken a two-pronged approach in the past few days. WKYC Director’s Cut blogger and senior director Frank Macek provides a link to the full video of the interview at his site. The second prong in the PD’s approach was a column on Sunday by reader representative Ted Diadiun. As his boss did Friday on WKYC, he talked about the very important journalistic light the newspaper shed upon two vital issues in Cuyahoga County in the past week, involving the proposed Medical Mart project, and now-former Cuyahoga County sheriff Gerald McFaul…who resigned that post “for health reasons” last week under the cloud of an investigation. Echoing (PD publisher) Egger: Who else would have the staff, expertise or resources to do that reporting? What radio talk show host, television reporter or blogger could have given citizens that information, and made it stick? Speaking as a blogger here…”not us”. We never claimed to be investigative reporters here, though we have actually broken some minor broadcast (and even print) stories. But aside from an occasional story broken by local TV investigative reporters, very few outlets have the resources to handle “the big stories” that need more than just surface reporting. And in her interview with WKYC, Goldberg noted the confusion that came with the “10 Endangered Newspapers” story…as it (apparently automatically) appeared on Time Magazine’s site, lending it more credibility. ELVIS EXPANDS HIS BUILDINGS: New York-based top 40 morning radio star Elvis Duran is going syndicated. Well, more so. Duran’s show has been added to the syndication roster of Clear Channel’s Premiere Radio arm, where it will be offered coast to coast. Of course, Clear Channel also owns Duran flagship WHTZ “Z100”, the top-rated New York City powerhouse now under competitive attack by CBS Radio’s new “Now FM” (WXRK/92.3). And here in Northeast Ohio, Clear Channel owns Duran’s Cleveland market affiliate WAKS/96.5 “Kiss FM”. Of course, “Elvis Duran and the Morning Show” has also been heard in markets like Philadelphia and Miami, with WAKS as his most recent addition. HELLO, FARGO: The North Dakota city of Fargo is basically, at last check, holding its collective breath…as the flooded Red River has risen to record levels. Though the river reportedly crested below levels that had been expected over the weekend, it’s still running quite high, and there are concerns that a coming storm could bring winds that could cause levee breaks and flooding problems. Throughout it all, radio has shined in Fargo, with no fewer than three competitive commercial radio news/talk operations going full-tilt providing residents with vital flood related information 24 hours a day. Along with KFGO, the former Clear Channel operation that itself is actually behind sandbags, and WDAY, the local news/talker owned by the “Forum” newspaper, there’s a third AM station in Fargo that’s devoting its efforts to covering the flood threat full time. It’s “The Flag”, known legally to the FCC as WZFG/1100 Dilworth MN (Dilworth is an eastern Fargo suburb). The station is owned by former WDAY general manager Scott Hennen, a talk show host who has occasionally been heard subbing for national talk radio personalities. Aside from noting the excellent job of community service provided by the three stations in a true time of crisis (we’ve dipped into streaming audio a few times to listen), there’s one other reason we mention it here…look at that frequency occupied by “The Flag”. WZFG indeed sits on 1100, the same frequency covered in “38 states and half of Canada” by Clear Channel talk WTAM here in Cleveland. And normally, it puts out just 440 watts of power at night, aimed away from Cleveland (and San Francisco, where religious KFAX occupies that frequency). But taking advantage of FCC rules, WZFG has been operating with as much as its full 50,000 watts of daytime power into the overnight hours. The FCC allows stations in emergency situations to maintain daytime power levels, and the situation facing Fargo would certainly qualify. Though the WZFG signal is obviously not making it anywhere near Northeast Ohio, we’ve heard that some folks to the west are now getting a mix of WFZG and WTAM via skywave propogation. OMW hears that KFGO/790 is also operating at night with daytime power levels, which has put it on some radios far to the east. LIVE FROM SEVEN HILLS/PARMA, OHIO — OMW is on the road this Sunday evening, and yes, we found our way to the WKYC/3 transmitter site on Broadview Road in Parma. Your Primary Editorial Voice(tm) braved the soggy, windy weather this evening to snap this first shot of the under construction tower that will hold the new digital antennas for WKYC, and for ideastream PBS affiliate WVIZ/25. No, we didn’t enlist the help of one of our new friends along the Parma residential street next to the WKYC transmitter site to post this from the area nearby. The “Seven Hills” part of our dateline is because we’re using the free Wifi facilities of a certain national chain eatery…with a location just down Broadview Road from the WKYC site, on the Seven Hills side of the Seven Hills/Parma line. We’re warm, indoors and having dinner. You can almost see the newly rising tower from this far away. It is being built directly adjacent to the existing WKYC/3 analog tower. Closer to the site, here’s more construction evidence…a much larger crane appears ready to hoist the next tower segment aloft. There’s more to tower construction than meets the eye, as our long-time friend and colleague Scott Fybush at NorthEast Radio Watch can certainly tell you. 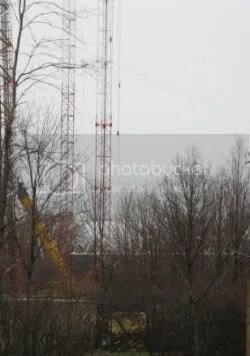 TOWER RISING: We’ve visited the transmitter site of Cleveland Gannett NBC affiliate WKYC/3 so often, the site’s neighbors living along a nearby Parma street are starting to recognize the OMW Mobile on sight. We’ll try to take more pictures if there is significant photographic evidence of a rising tower, and then, assuming the weather holds, it’ll take about four to six weeks to fully raise the new WKYC/WVIZ tower. SPEAKING OF 13TH AND LAKESIDE: A story that as far as we know did NOT get told on WKYC’s “Channel 3 News” itself affected a lot of people in the building this past week. But we didn’t know about it until we stumbled onto WKYC night assignment editor Danielle Fink’s “Swing By And Spray” blog. I am minding my own business doing my thing, getting ready for yet another web chat during the 7pm news when my cameraman Craig comes flying into the newsroom toward me. He’s speaking a mile a minute and says ‘there’s been an accident in the garage and your car was hit.’ He then flies back through the full length of the newsroom and down the stairs to the parking garage. What I was told: an SUV being driven by a man professing to Cleveland Police officers that he was under the influence of ‘something’ had driven erratically down the hill leading to the Channel 3 Parking Garage, had entered the parking garage, hopped the curb missing numerous other vehicles and numerous concrete barriers and had struck my vehicle smack dab in the center of the driver’s side door….which in turn pushed my vehicle into Carole Sullivan’s. It appears Carole’s car sustained slight damage/scratches /pings. My car, on the other hand, was t-boned between a concrete barrier and the SUV and was not drivable. We’re not surprised that Danielle is still freaked out about it. She’s still in the early stages of dealing with insurance companies and trying to figure out what can be done with her car…which was basically destroyed while parked in a theoretically secure underground parking lot. THIS IS STILL NOT HERE: Nope, at last check, Raycom Media MyNetwork TV affiliate WUAB/43 hasn’t lit up its DT 43.2 channel with MGM’s “This TV”, a subchannel that will deliver second-tier catalog MGM movies and other programming to digital TV (and presumably digital cable) viewers starting on April 1. That doesn’t mean that our readers aren’t still keeping track. We hear that “This TV” has started populating its programming guide information with schedules, and that after all this time, 43.2 is no longer listed as “Tube”…it, too, shows up as “THIS TV” on digital tuners and converter boxes. All this for a channel that we’re pretty sure we’re not going to watch to any degree. Like some of our other readers, we do hope that someone in the Cleveland TV market picks up Retro Television Network (RTN), with what we consider to be a more appealing mix of classic sitcoms and dramas. Our earlier item on the conslidation between the co-owned Medina County Gazette and the Elyria Chronicle-Telegram got a lot of response. I would like to comment on the merger of the Elyria Chronicle-Telegram and the Medina Gazette. Earlier this month, we – as in, Lorain County Printing and Publishing Co., the parent of both papers — moved production of The Gazette to the Elyria location. That means copy editors for the news and sports side as well as production for other departments – advertising and classified – moved, too. We did not move the reporters out of Medina – that truly would have been silly. And Liz Sheaffer, the managing editor at The Gazette, still is in Medina to guide them. We did all this with a reason that should be clear to anyone in our industry: to save money. Given the state of our economy, and the even worse state of our industry overall, we’d be crazy to continue to operate the papers independent of one another as has been the case since the Hudnutt family bought The Gazette in 1964. We wanted to find ways to save money so we could continue to provide our readers with what they’ve become accustomed – insightful stories by award-winning sports writers, hard-hitting news stories by writers who know the area and top-notch photography. For fairly small papers, we’ve got pretty tremendous staffs, and we’re proud of them both. We definitely don’t want either paper to go away or their independent identities, either. In fact, we want to find a way to strengthen both papers and emerge even stronger when this terrible period in our industry comes to an end. I guess what bothers me about what has been said in some of the comments is that they imply Elyria is running the show for The Gazette. That’s not the case. The Medina professionals who moved to the Elyria locale are laying out the paper (albeit with a Chronicle designer doing or directing Page 1 layout, which admittedly looks different than it used to) and Liz Sheaffer continues to decide what stories will be written and where they’ll appear in the paper. She was making those decisions before, and she’s still making them. Yes, an Elyria story did appear in one paper, but that was only because a family member involved in the story was from Medina County, and that happened to be the day of the switchover, which obviously created some upheaval and doesn’t constitute a normal day by anybody’s definition. LIGHTING UP “THIS”: Buried deep within the Cleveland Plain Dealer’s Cleveland.com, hidden under those annoying rollover ads, and probably in small print in the Dead Trees edition of the PD, is a note that Raycom Media MyNetwork TV affiliate WUAB/43 “My 43” will finally launch the “This TV” subchannel soon. This TV, a new classic-movie channel, will launch on WUAB Channel 43 on Wednesday, April 1. Raycom Media is partnering with Metro-Goldwyn-Mayer Studio Inc. (MGM) to roll out the network, according to a release. This TV will tap into MGM’s library of film and television programming resources. OMW and our readers noticed some time ago that WUAB put up a “This TV” ID slide on its digital subchannel 43.2, where “This” will live in Cleveland. HIGH DEFINITION HOOPS: It’s a big weekend for Ohio high school basketball, as all four state divisions will see the final round of boys’ basketball playoffs. Mike Cairns, Brad Sellers, Al Pawlowski, Tony White, Andre Knott, and Pat Vuyanich will all be involved providing play-by-play, color commentary, and sideline reports. In addition, Sue Ann Robak, Dave Wojciechowski and Jim Isabella, the ‘Principal of High School Sports’ will be in the STO studio providing updates and halftime programming. Prior to the Div. I Championship at 8:00pm, Robak and company will recap the previous three championships and preview the Division I match-up. We actually missed this the first time we read the release – yes, that’s now-former WEWS/5 “NewsChannel 5” sports reporter/anchor Sue Ann Robak making at least a one-day return to the Cleveland TV sports scene. We’ll have to check in with the SportsTime Ohio folks to see if Robak has any more planned work on the channel. STO has employed many former over-air sports reporters in the Cleveland market, and even bought shows produced by one of Robak’s now-former co-workers, current “NewsChannel 5” sports director Andy Baskin. Speaking of the high school basketball playoffs, it turns out that Rubber City Radio news/oldies WAKR/1590 Akron will be the sole radio home of the St. Vincent/St. Mary Fighting Irish team’s playoff run. The station carries the Fighting Irish state semi-final game on Friday at 2 PM, and will air the team’s game on Championship Saturday if the Fighiting Irish win their Friday contest. AND SPEAKING OF WEST MARKET STREET: While fishing through the aforementioned TVNewsday site to find the article about WUAB’s carriage of “This TV”, we couldn’t help but notice the face of a local radio executive adorning the top of the site’s main page. The news trade association won’t be replacing Akron native Barbara Cochran when she steps down as president in June, so Esposito will be front and center dealing with a number of RTNDA issues, including embracing the digital world – from its own communications and operations, to the expanding world of online news delivery. At the Akron Radio Center, Esposito has a front row seat to that new world…with Rubber City’s existing and extensive news website AkronNewsNow.com, and the newest addition on West Market, the 24/7 streaming audio news feed dubbed “WAKRNewsNow”. Jessell’s article points out that under Esposito’s direction, that the RTNDA is moving towards becoming the RTDNA – which stands for the “Radio Television Digital News Association”. And like the stations operated by the group’s members, the RTNDA is also dealing with lower budgets…with Esposito noting that digital technology is helping the association save money for both it and for members.